Try to embrace the possibilities offered by McCloud’s definition of comics (Scott McCloud, “Understanding Comics,” Harper Collins, 1994, pg. 9). For Project 2, you will create your own comic according to Scott McCloud’s definition of the art form in his book, “Understanding Comics.” According to McCloud, comics are “juxtaposed pictorial and other images in deliberate sequence” (9). They may—but do not necessarily have to—feature narrative storylines, or include speech bubbles and superheroes. They don’t even have to be drawn as cartoons. For this project, let go of your preconceived notions about comics and let the possibilities of the art form work for you, your specific ideas, and your new-found knowledge of the program Adobe Illustrator, which we will use to execute this project. Comics is inherently a democratic medium, since fancy tools and advanced drawing ability are not required for their execution. (McCloud, 197). Comics can take advantage of the power of both word and image. Unfortunately this sometimes means they may not be taken seriously. See more in Chapter 6 (McCloud, 17). 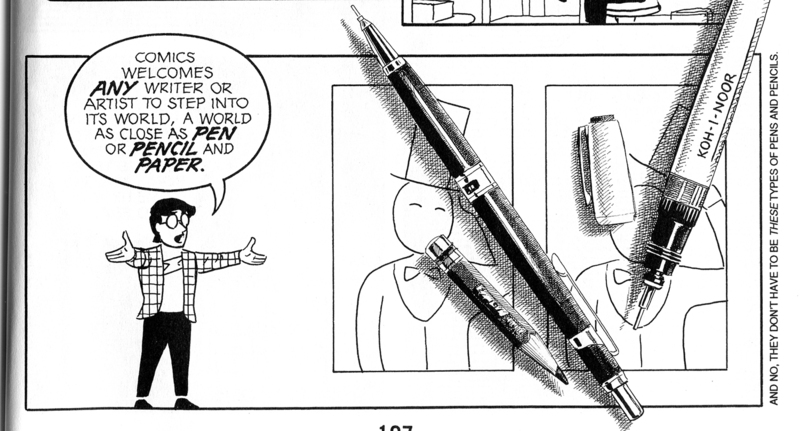 Another fascinating idea about comics is the fact that they are at once both and neither art and writing (McCloud, 17). This means you might embrace one aspect of the medium more or less, depending on your strengths and interests. If you do incorporate words into your comic along with images, make sure to maximize your use of typography (fonts), or handwriting, in a way that is visually engaging and appropriate to your goals. Finally, don’t forget to consider the question: What is the future of comics? Now that we do much of our reading on screens and in digital spaces, you may decide to choose an approach that is new or surprising. Think about the difference between reading comics online (Eroyn Franklin) versus reading McCloud’s printed book. You should make a conscious decision about what the final presentation of your comic will be. Make note of it when you turn in your sketch. Will your final presentation be print-based or digital? If print-based, what size will it be? Where will you print it? If digital, what specific space do you envision your readers using? Your Illustrator file should be set up accordingly. We will have an introduction to the Illustrator workspace in class, which will highlight specific tools and techniques. To supplement these in-class lectures, you are expected to follow the required tutorials as homework and to practice the techniques outside of class as you prepare to make your final comic. Your instructor will provide one-on-one assistance as time allows. You are welcome and encouraged to seek out additional tutorials to supplement your knowledge, and to come to office hours for help. 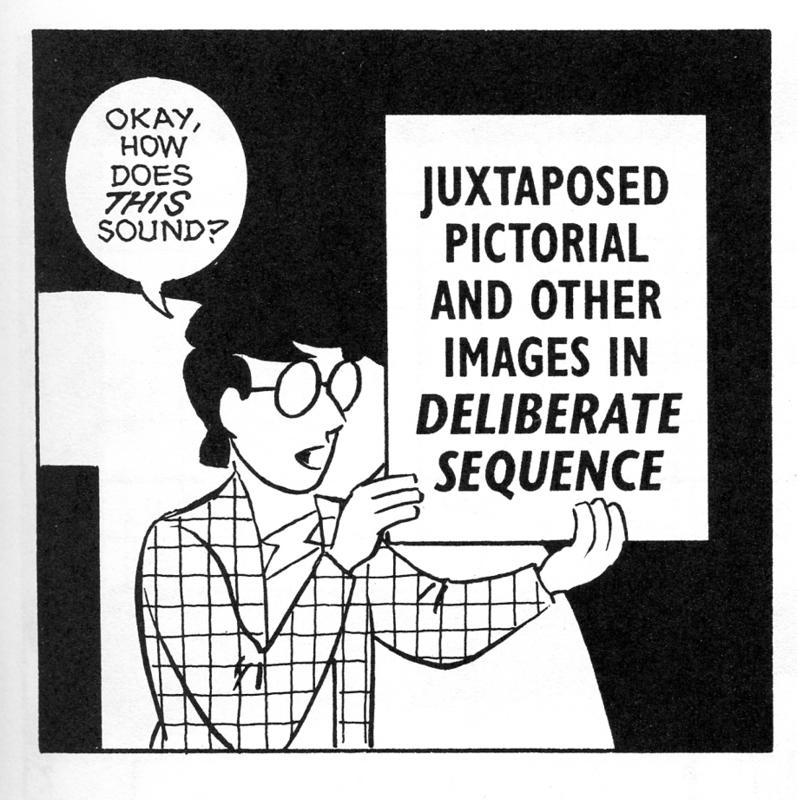 “Understanding Comics” by Scott McCloud. Buy at Bookie, or order online. Web comics by Eroyn Franklin: Can Free Pop-Up Clinics Save American Healthcare? If you are interested in experimenting with using a drawing tablet and stylus in conjunction with Illustrator, rather than a mouse, you can visit the Creativity Suite (Avery 451, open weekdays during the day) and/or the PC computer lab in SPARK 210 (open weekday evenings). Bring a nearly complete draft of your comic, ready to open in Illustrator to share with your classmates. Make sure to organize all the work you have done using the Layers Panel. If your intended final output is a printed format, make sure to bring a sample of what this will look like as well. It is also a good idea to save a copy of your Illustrator file a PDF. Your finished file re-saved as a PDF. When saving, make sure “Preserve Illustrator Editing Capabilities” is unchecked. Call this file “yourlastname-yourfirstname-project-02.pdf” (Before you do this, make sure your raster effects are set to high. Go to File > Document Setup and choose Preset: [High Resolution]). Printed copy of your comic, if this is part of your final output plan. Get a good print made, even if you have to go to Cougar Copies. Your peer critique packet from Tuesday (If you were absent, you should print the PDF and find class members who will let you critique their work outside class: Email your instructor if you need assistance). Make sure to post Blog 5: Comics. Save your comic as a JPG to post with your writing. Go to File > Export > Export As and choose JPG under the file format menu. Then, in the next dialog box, make sure Quality is set to Maximum. For web viewing, Resolution here should be set to Screen (72ppi). If you feel strongly that you would like to revise this project once you have received your evaluations, you may do so under the advisement of your instructor. Make an appointment to meet so you can discuss goals and due dates for the revision. In order for a grade to be revised, significant improvements will need to be made. Likewise, in order for a project to be revised, it should have been turned in on time when it was initially due.